Peter will be a guest at Galaxy Con 6 - 8 September, 2013, at Hotel Maritim, Düsseldorf, Germany. Armin Shimermann, Ronald. D. Moore, Michael Hogan, Sasha Roiz, Jewel Staite, Casey Biggs, Ioan Gruffudd, Natasha Henstridge, René Auberjonois, Edward James Olmos, Andrea Thompson, Aron Eisenberg. Other guests: Linda Hamilton, Lance Henriksen, Timothy Balme, Cassandra Peterson, Anthony Michael Hall, Michael Biehn, Edward Furlong, Kristianna Loken and more. It's the largest gathering of Terminator stars since the last movie! Unfortunately, Starcon in Vancouver, June 2011, was canceled. 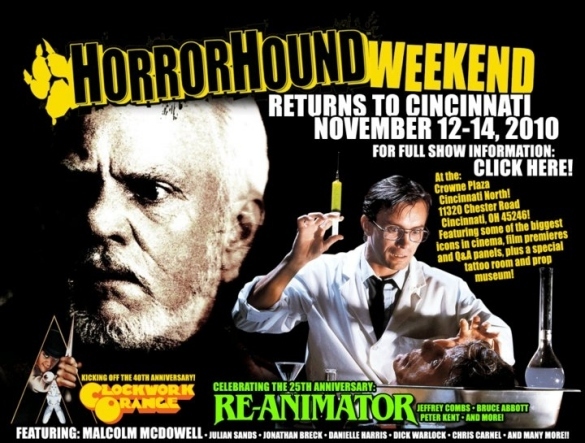 Peter Kent was a guest at the HorrorHoundWeekend on November 12-14, 2010, in Cincinatti, Ohio. Peter was invited as an alumni of Re-Animator. Peter was a guest at Gatecon in Vancouver where he did a StuntDawgs series talk as well as a presentation of his ARK program (Actors Reading for Kids) with actor Andrew Jackson.